In general, the recommended sampling rate for CAN bus or I2C analysis is 10x the bit-rate. If the waveform is not noisy, the sampling rate can be set to around 4-5x the bit-rate. 8-channel 500 MHz oscilloscope with 16 logic inputs, for applications where four channels aren't enough. Support for eight analog channels, 16 bits with 250MHz logic bandwidth, 16MP of recording memory, power analysis, serial bus analysis, and a broad selection of voltage and current probes. generation oscilloscope from Yokogawa with industry leading 2.5 million wfms/sec and lowest dead time. Winner of Test & Measurement World's "Best in Test" award. 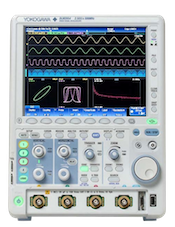 200, 350, and 500MHz mixed-signal oscilloscopes for every engineer. Best-in-class performance in usability, acquisition, analysis, and display—all at a price you can digest. Options include serial bus, vehicle bus, and power supply analysis functions. 500MHz, 1.0GHz, and 1.5GHz DSO and MSO models for debug, waveform characterization, bench top, or automated test applications. 4 channel models with 16 or 32 logic inputs. 12th generation oscilloscope with ergonomic physical and on-screen improvements. A mixed signal oscilloscope is an instrument enabling the simultaneous, time correlated observations and analysis of analog with digital (logic) signals, to establish causal relationships between the various areas of a device's electronics. They are purpose-built tools for troubleshooting electrical anomalies, measuring parametric values, and monitoring cause and effect relationships between signals.